One big drawback to living in the tropics? Hurricanes, of course! And, it looks like the Big Island of Hawaii could be the target for a hurricane expected to make landfall sometime Wednesday or Thursday. In fact, the Big Island of Hawaii is under a hurricane warning in anticipation of Hurricane Madeline, which is moving toward the island and could make landfall. In response to the latest storm forecast, the Honolulu Star Advertiser reports that many Big Island residents and visitors are taking precautions, evacuating animals and stockpiling water in the event the storm hits close to home. In fact, The National Weather Service has issued a hurricane warning as Hurricane Madeline, a Category 2 storm, hurtled west toward the island, urging residents to rush through preparations to protect themselves and their property and expect hurricane conditions within the next 36 hours. Hurricanes Madeline and Lester are both on track to hit the Big Island; however, forecasters believe Hurricane Lester will be downgraded to a Tropical Storm by the time it hits the Big Island. “If they’re not prepared now, they should get prepared fast,” said Chevy Chevalier, a meteorologist with the weather service. Hurricane Madeline is expected to weaken but likely will remain a hurricane as it passes the state, Chevalier said. 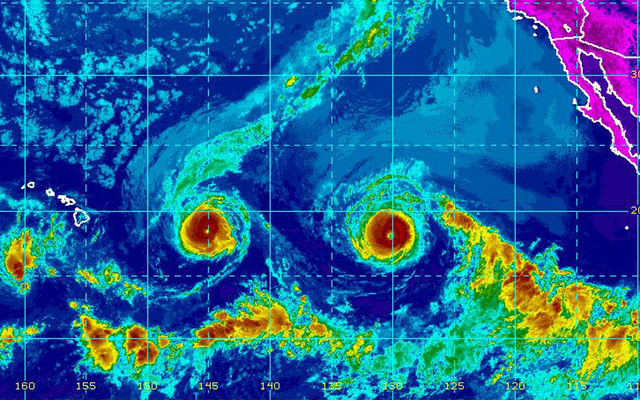 Forecasters tell the Honolulu Star Bulletin they’re expecting Madeline to pass just south of the Big Island around 2 a.m. Thursday. But if the storm track shifts slightly to the north, the eye of the storm could pass over land. 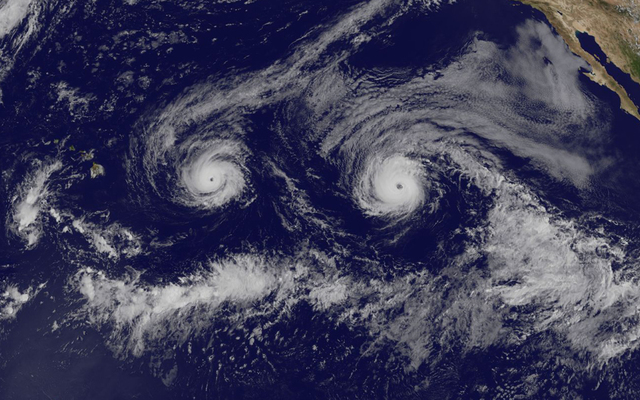 The last hurricane to make landfall in Hawaii was Hurricane Iniki in 1992, which hit Kauai, Chevalier told reporters. On Madeline’s heels, a second Pacific hurricane, called Lester, is expected to weaken to a tropical storm as it passes the state, Chevalier told the paper. The timing of both storms is inconvenient at best. President Barack Obama is scheduled to visit Oahu this week. However, the White House is tracking the weather developments closely, but it doesn’t anticipate changing Obama’s schedule. That’s because the islands of Maui, Molokai and Lanai were under a tropical storm watch, but there were no alerts for Oahu or Kauai. Satellite images show both hurricans well-formed and following a similar track. The Coast Guard will close Hilo and Kawaiahae ports at 8 p.m. and Young Brothers cancelled its voyages from Honolulu to Hilo and Molokai Tuesday (No cargo will be accepted at those ports until further notice, Young Brothers said in an announcement). Sections of Hawaii Volcanoes National Park will close starting at 5 p.m. (The closures on Wednesday include the coastal lava viewing area, Chain of Craters Road, and the Jaggar Museum, Kilauea Visitors Center and the entrance station to the park. The lava viewing area will close by 9 a.m. Wednesday). The Kulanaokuaiki Campground and Hilina Pali \Road, all backcountry sites and Mauna Loa Road from Kipukapuaulu to the overlook will close at 5 p.m. Tuesday. For those who are flying Hawaiian Airlines to or from the Big Island, Hawaiian Airlines announced it will allow a one-time reservation change without a fee on Big Island flights Wednesday and Thursday. And, if you’ve booked a Big Island Activity, such as a Volcano hike, luau, or scuba adventure through Hawaii Aloha Travel, a tour professional will contact you if your plans change.